Birds fly in a flock of their own kind. We mention nature and forget ourselves in it. So engrained is the trope of the animal in the West that animal truisms are seared into our shared cultural memory: the Boy Who Cried Wolf, the Wolf in Sheep’s Clothing, The Grannie-Masking Wolf of Red Riding Hood fame, the proverbial Fox in the Hen House, Chicken Little, Foxy Lady, Sly like a Fox, Mary’s Little Lamb, Lassie, Bambi, the Cheshire cat… to say nothing of Puss in Boots, the Dog That Won’t Hunt, Eating Crow, the Golden Egg Laying Goose, the Baby Bringing Stork, the Early Worm Catching Bird, Pop Goes the Weasel, Three Blind Mice, the Three Little Pigs, and the Little Piggy who cried ‘Wee, Wee Wee’ all the way home. Animals have often served as potent metaphors, argues philosopher Max Black (1962:40-2; Blier 1987:206), because they force new forms of interaction and engagement delimited vis-à-vis long standing assumptions. These assumptions challenge credibility (are foxes any more sly than wolves, dogs, or cats?). Related assumptions also reify enduring perceptions of animal-human complements that individually and together heighten the attendant potency of animal symbolism. Cary Wolfe’s Animal Rites: American Culture, the Discourse of Species, and the Posthumanist Theory (2003) offers a provocative look into the role of animals in human thought and action. Addressing subjects such as animal sacrifice and debates about animal-human difference (the human potential evinced by the use of hands and fingers, for example),Wolfe also investigates larger symbolic systems and practices involving animals. Wolfe’s 2003 anthology (Zoontologies:the Question of the Animal) similarly takes up the boundaries between the animal and human worlds, addressing an array of ethical and philosophical questions posed therein. These are framed around core theoretical engagements (Heidegger, Freud, Lacan, Derrida, Deleuze, and Lyotard among others) as well as questions of interest to the arts. The latter range from Western visual artists (William Wegman and Joseph Beuys) to popular culture (Jurassic Park and Monty Roberts, the “horse whisperer”). One could easily add to this interest not only recent humanities explorations addressing evolution such as the Gottschall and Wilson anthology, The Literary Animal: Evolution and the Nature of Narrative (Rethinking Theory, 2005) but also recent explorations in the field of Environmental Anthropology (Dove and Carpenter, eds., 2007). The co-joining of popular appeal and attendant religious uproar as related to animal portrayals in recent animated films is also striking. Among the recent examples are Avatar (2009) and Happy Feet (2006) (the latter a striking complement to attempts to turn a group of “gay” penguins in a Berlin zoo “straight”). Interesting too arenews stories highlighting of the “split” of the “gay” male penguin pair in New York Central Park’s zoo — as well as accounts of Boston’s female swan couple, Romeo and Juliet, whose very names reveal the central role anthropomorphism assumes in our dealings with the animals around us. When Alfred Gell writes of art as a trap (“Vogel’s Net: Traps as Artworks and Artworks as Traps”-1996), he addresses issues of human-animal engagement (the primacy of prey, the thrill of capture) as well as the enduring dialectic between the ordinary (the animal trap) and the richly articulated (works of art), here heightened by the provocative idiom of animal-human encounter within the context of visual engagement. Allen F. Roberts similarly has explored an array of issues concerning animal identity and representation in African art (1995), addressing among other questions why so few animal species became the subjects of African visual and performative engagement, and offering an answer that is as poignant as it is simple: namely, some animals are “good to think” with. [ii] Whether as a frame for larger philosophical engagement or as political tropes framed around African creation myths, royal divination icons, religion, and healing arts (see also Blier 1990-1, 1995, 2004), animals serve as a striking idiom through which human values and broader theoretical engagement are grounded. Some animals, such as elephants (Ross 1995), are particularly provocative subjects of both thought and art. Theories, like animals (and of course humans), have lives. Theories can be said to die not only when scholars prove them “wrong” but also offer viable alternatives. Hence the Lévi-Straussian Structuralism of Douglas and others of her generation was eventually superceded by Post-Modernism (Post-Structuralism), Neo-Evolutionism, or Environmental perspectives, among these the explorations of Cary Wolfe, or Gottschall and Wilson (2005 ), or Dove and Carpenter (2007). British artist and African art connoisseur Leon Underwood published a short illustrated poetry book entitled Animalia, or Fibs About Beasts, Engraved on Wood and Ensnared in Verse (1926). I bring the work into play here, not only because its title is reflected in my own, but also because in many ways the issues he raises are germane. Theories, like objects (and art works, artifacts, or persons) ensnare us with provocative “fibs” (partial views, unique vantages, half truths). In some ways, the primacy of theory lies not only in issues of universality (science) but also its “art” value (perspectives that press one to think about things in a new way). Theories, like animals, matter, in my view, not necessarily only because they are “right” or “wrong” but also because of the challenge they pose to us to think about (and through) things in a new way. The death blow to a given theoretical frame often can be sensed when everyone finally “gets it.” At the risk of pushback, I wonder how much it matters if a given theory is “right” or “wrong” as long as it is something “good to think with,” a frame (trap, ensnarement, vantage, partial view) that elicits new insight, even if it may have been proved outdated or false. Many portrayals of animals in African art (masks among other forms) are notable in part for their striking elements of anthromorphism, among these earrings (on Bamana Chiwara masks), royal regalia (Ife terracotta sculptures), performative elements (Dogon monkey maskers as pick pockets), and roles in human-deity communication (divination – hornbills, spiders, crocodiles, and pale foxes, to name but a few). This is true not least in Ife, the ancient capital of the Yoruba in southwestern Nigeria. In this important center, one comes across numerous animal species on sale in the local animal market near the Ogun Mogun temple complex in front of the palace. One can find here not only domestic animals for sale but also an array of wild animals – some of which are sold alive (chameleons, snails and certain birds), others sold as parts – the skin of leopards, crocodile teeth, the meat and/or horns of varied antelope species among these. I visitedthis market on numerous occasions and observedthe sale of these animals in this setting near the main temple of Ife’s hunting god, Ogun. Knowing the importance of diverse plant and zoological species in Ifa divination and other contexts, as well as the enduring significance of related beliefs in this center, makes clear the iconic complexity of animal portrayals in ancient Ife art. Local knowledge (place, time, social frame) is critical to our understanding of these works (Geertz 1985). The corpus of ancient Ife animal sculpture offers a rich template from which to examine similar concerns. Here too, there are also notable differences in how animals (even within the same species) are portrayed. Some are identified with regalia fit for kings. Others are secured with cord leads suggesting imminent sacrifice, offerings which in some respects complement human ritual deaths. In the end what is especially remarkable in these animal personifications is their primacy in the early art corpus and the remarkable detailing with which they are rendered, attributes which also conform with some Ife canons on human portrayal as well. In some ways, portrayals of animals are among of the most complex and interesting artistic exemplars because of expectations and the fact that models are not always readily available. Several days before the end of my first research trip to Ife, capital of the Yoruba in southwestern Nigeria, I learned that not far from the city there lived a mudfish, some five feet in length and residing in a spring and adjacent brook which was part of a local healing shrine. Years earlier an Ife acquaintance had been treated successfully here for a painful ear infection and fever. I decided to visit this amazing mudfish that purportedly would come out of the water and onto land for food treats. Like others of the lungfish species, the mudfish possesses ancillary lungs that enable it to survive out of water for weeks and months at a time. After accessing this shrine on foot via a long winding dirt track, I interviewed the priest healer in charge and learned something of the temple’s history. A devotee of Mami Wata (a water goddess linked to European and west Asian trade, who brings material and other benefits to believers) from the Urhobo in the Niger Delta area to the south, the priest had moved to the Ife area in his youth. From him I purchased a small bag of the mudfish’s favorite cookies and waited expectantly at the edge of the spring as he tossed the crumpled cookies on the water surface while offering prayers intended for the ears of this remarkable being. Soon the spring’s surface began to shimmer with tiny bubbles and myriad mudfish and other aquatic denizens gulped down the proffered sweets. Alas, the giant mudfish, already satiated from a healing ceremony before my arrival, chose not to come to land. What little I did discern of this fish nonetheless reinforced the uniqueness of the species and why such animals figure so prominently in early Ife art. A particularly striking thirteenth to fourteenth century C.E. terra cotta mudfish depiction historically was housed in the city’s Omitoto shrine in Ilorin quarter — under the supervision of Ife’s powerful Chief Obaloran, head of the Ilode ward where the Obatala temple is located. The terra cotta mudfish long associated with his family is known locally as Orisa Ito. During the annual Odun Ose festival dedicated to Omitoto, held every year in October at the beginning of the dry season and related harvest-New Years activities, the sculpture (which most likely dates to the late thirteenth or early fourteenth century) was carried during the related rituals by a ritual specialist dressed in plantain leaves. While the exact origins of this procession are not clear, the term odun refers to year, and ose identifies the traditional five day Yoruba market week, underscoring the likely importance of this event (and the mudfish referent) with the cycle of time, and specifically the yearly transition from dry season to rainy season. The mudfish, with its unusual ability to estivate (that is, to survive for months in a hibernation-like state in dried spring or river beds using its ancillary lungs), seemingly comes “back to life” after rains again fill its resident pool or river bed with water. As such this animal is a particularly apt referent to the cycle of seasonal transition. Omitoto, who is also identified (Fasogun n.d.1) as having “carried igba-iwa to Ile-Ife,” was a central figure in the earth’s beginnings at Ife. [iii] This same igba-iwa vessel is said to have held the necessary Ife offerings conveyed to the heavens each year in exchange for well-being and plenty (Fabunmi (1985:194). The identity of the mudfish at once with the earth’s creation, and with rituals which preserved life more generally, also is in keeping with the mudfish’s unique identity with seasonal transition — not only the beginning of the dry season, but also the arrival of the rains. Indeed this unusual fish is said by some to vomit water at this time into the dried river beds and springs, thus assuring their renewal to meet the needs of local inhabitants. Mudfish are among a group of unusual animal species that figure centrally in the corpus of ancient arts from Ife and other Yoruba centers. A variant of these mudfish forms is conveyed through the image of a human form with outward extending fish or snake-form legs or feet. This is a form that in Benin royal art has come to be identified with both the ruler Oba Ohen (who was paralyzed) and with Olokun, god of the sea. The striking bi-morphism of these “fish” — as denizens of both water and land — provides them with unique symbolic potency, in relationship to (among other things) ideas of autochthony. Two unusual birds share similar visual and symbolic potency in ancient Yoruba art. The first is the Pennant Wing Nightjar, a small owl-like bird species that migrates to this area during the rainy season, where it mates, during which time senior males grow long wing streamers double the normal size, that ripple in the air in flight, in a manner suggestive of snakes and or lightning. These birds figure in several ancient Yoruba area art works (a Janus terracotta man-bird figure from Ife and several bronzes from the Niger River area to the east that seem to be linked to this center). In both cases they appear to be identified with the ancient Ife thunder god, Oramfe. There is a somewhat complementary bird, the African Paradise Flycatcher (okin in Yoruba). 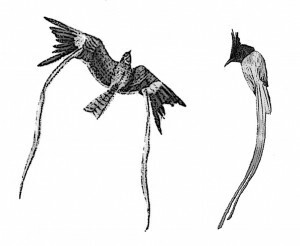 Both birds are notable for their bi-morphism and for their rarity and distinctiveness, suggesting a possible conceptual link between them. During pairing season, senior males of the African Paradise Flycatcher species grow long tail streamers double the normal seventeen-inch length of their tail feathers. These streamers, which ripple as the birds fly, are incorporated into royal Ife and Yoruba crowns. Both avian species suggest the importance of both anomaly and change in the animal world as a reference to ritual and political primacy. 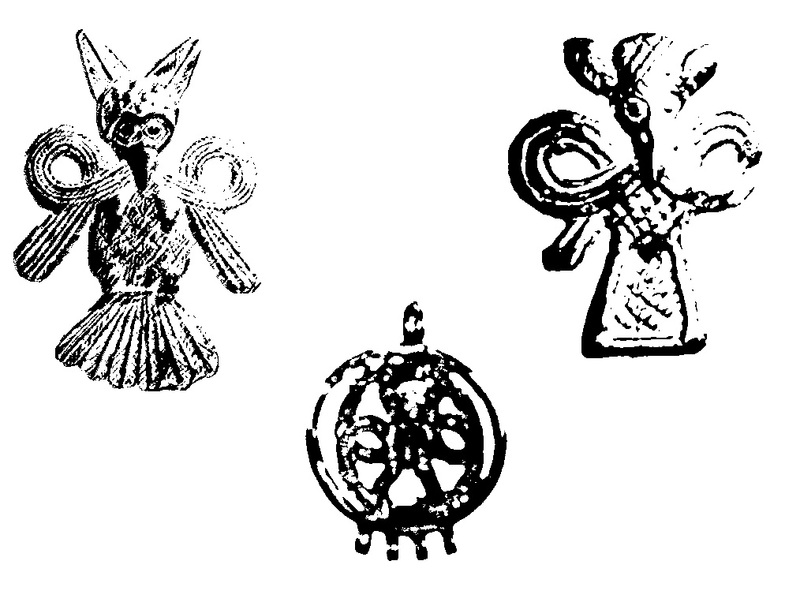 These three animal species all have unique local primacy (and symbolic power), yet all three appear to have early foreign roots, most likely in ancient Greek, Coptic, and Early Medieval European idioms of fish legged Sirens (the early source for Mami Wata here it appears[iv]) and snake winged Harpies (see below) as also do early Gorgon motifs in this area– human heads with snakes emerging from the nostrils or ears). These motifspoint to notable visual and iconic similarities with, among others, twelfth to early fourteenth works from pilgrimage sites in Great Britain and France. Most likely complementary formsenteredinto the area of central Nigeria around the same time as part of richly colored Coptic textile forms from Egypt from this era.Arriving here perhaps around the same time were early forms of Nubian jewelry (see below), works that also appear to have left its imprint on one of the thirteenth to fourteenth century fragments from Ife, a ram head pectoral from the site of Oke Eso. Since the ram, like the mudfish and bi-morphic birds, is so closely integrated into the fabric of Yoruba belief, does it really matter where these motifs originally came from, when they arrived, or how? Or to the contrary, since all symbolic forms ultimately are delimited locally (their meanings, contexts, qualities of empowerment specific to place and time) — one wonders whether these local perspectives necessarily carry more symbolic or theoretical weight than others that are in play. 1987 Anatomy of Architecture: Ontology and Metaphor in Batammaliba Architectural Expression. Chicago: Chicago University Press. 1990 “King Glele of Danhomé: Divination Portraits of a Lion King and Man of Iron (Part I),” African Arts 23.4: 42-53, 93-94. 1991 “King Glele of Danhomé: Dynasty and Destiny (Part II),” African Art 24.1: 44-55, 101-103. 1995 African Vodun: Art, Psychology, and Power. Chicago: University of Chicago Press. 2004 “African Creation Myths as Political Strategy” in African Arts vol 37, no. 1, pp. 39–45, 94. Forthcoming. Past Presence: Ife Art in Yoruba History. 1957 “Animals in Lele Religious Symbolism,” Africa, XXVII, 1: 46-58. 1966 Purity and Danger, Concepts of Pollution and Taboo. London: Routledge. 1970 Natural Symbols, Explorations in Cosmology. London: Barrie and Rockliff. 1975 Implicit Meanings, Essays in Anthropology. London: Routledge. 1973 Rules and Meanings: The Anthropology of Everyday Knowledge. London: Penguin. Drewal, Henry John et al. 2008 Mami Wata: Arts for Water Spirits in Africa and Its Diasporas. Los Angeles: Fowler Museum of UCLA and University of Washington Press. 1985 “An anthology of historical notes on Ife city”Ife: The Genesis of Yoruba Race. Ikeja, Nigeria: John West Publications, Ltd.
n.d.. “A Brief Constitutional History of the Ancient City of Ile Ife Ooye Lagbo (the City of the Survivors)” Seminar Paper presented at the Conference on Yoruba Civilization, University of Ife, Ile-Ife. July 1976. 1985 Local Knowledge: Further Essays In Interpretive Anthropology. New York: Basic Books. 1996 “Vogel’s Net: Traps as Artworks and Artworks as Traps” Journal of Material Culture, Vol. 1, No. 1, 15-38. 1997 “To see or not to see: Looking as an object of exchange in the New Guinea Highlands” Rethinking Visual Anthropology, ed. Marcus Banks and Howard Morphy. London: Yale University Press (170-185). Gottschall, Jonathan and David Sloan Wilson, eds. 2005 The Literary Animal: Evolution and the Nature of Narrative (Rethinking Theory). Evanston: Northwestern University Press. 1988 What is an Animal? London: Routledge. 1987 Women. Fire and Dangerous things: What Categories Reveal About the Mind. Chicago: University of Chicago Press. 1973 “Why Is the Cassowary a Canoe Prow? Art Journal, Vol. 33, No. 1 (Autumn): 41-45. 1995 Animals in African Art: From the Familiar to The Marvelous. New York: Prestel. 1995 Elephant: The Animal and Its Ivory in African Culture. Los Angeles: University of California Press. 2003 Animal Rites: American Culture, the Discourse of Species, and the Posthumanist Theory. Chicago: University of Chicago Press. 2003 Zoontologies:the Question of the Animal. Minnesota: University of Minnesota. Dove, Michael and Carol Carpenter, eds. 2007 Environmental Anthropology: A Historical Reader (Blackwell Anthologies in Social and Cultural Anthropology). London: Blackwell. 1926 Animalia, or Fibs About Beasts, Engraved on Wood and Ensnared in Verse. New York: Payson and Clarke. [i] See also Gillison 1997:174-5. Related issues extend back to Durkheim and Mauss (Primitive Classification – 1902) and forward to the works of George Lakoff (1987) and Timothy Ingold (1988) that touch on cognitive issues and related metaphors. I thank Parker Shipton for reminding me of these sources and for other insights into this piece. [ii] This idea extending back to Claude Lévi-Strauss among others. [iii] Perhaps in part for this reason, Fabunmi suggests (1969:.5) that Omitoto-Ose “…held a very important office in…government [performing her role] with great credit.” He adds: “Some Ife historians say that she had no issue but she adopted Obaloran as a son and brought him from his home in Iloran to her own home at Ilode where the present Chief Obaloran still lives.” Fasogun however identifies (n.d.1) Omitoto as one of the original thirteen chief-priests of Ife (Chapter-Op), suggesting that this chieftaincy only later was taken on by Obaloran. 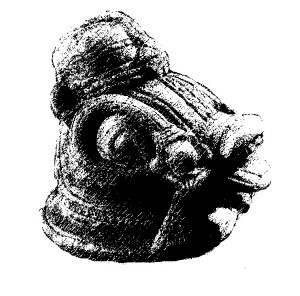 [iv] A later era diffusion of the “siren” motif in southern Nigeria has been advanced by Henry J. Drewal, whose Education Ph.D. (Teachers’ College, Columbia) rather than more standard academic degree program (Art History or Anthropology for example) seems to a more comparative rather than a more historical or theoretical vantage. Suzanne Blier’s text offers a rich array of points of contact. Let me just pick out two. To address her final questions first: As a historian (of art) I would answer both with “yes”. The general and the specific are always at stake and condition each other. During the formative period of the Greek polis, for example, the ancient Greeks (I draw here on the work of Lorenz Winkler-Horacek, Monster in der frühgriechischen Kunst/Monsters in Early Greek Art, Berlin & New York: de Gruyter, forthcoming 2010), took over several figures of mixed creatures as divine, supra-natural beings from the Near East, while at the same time transforming them to populate their imaginary of the uncivilized, liminal world “outside” the polis. Professor Blier describes several traps that guide or challenge our human perception of the animal. I wonder whether anthropomorphism is itself another of these traps. Although I would generally agree with Lorraine Daston and Gregg Mitman that we cannot escape anthropomorphism (Lorraine Daston – Gregg Mitman [eds. ], Thinking With Animals. New Perspectives on Anthropomorphism, New York: Columbia University Press 2005), in a particular case, such as that of animal metaphors, it might not always be clear what we consider as human or animal-like. What is signifier and what is the signified, to remain in the structuralist model (or what is the egg and what the hen to remain in animal similes)? What is the point of comparison or of affinity? Slyness is a human concept that gets projected onto the animal world and than re-projected onto the human. Or is it? Why are the fox sly and, indeed, not the wolf, dog or cat? Kings assimilate themselves to lions, since the lion is considered ruler of the animal kingdom – but why the lion? It seems to me that there is more zoomorphism at play than we would assume at first sight. Suzanne Blier’s fascinating essay combines her own fieldwork experiences with an overview of extensive theoretical writings on animals and animal symbolism. I have not read all of the post-structuralist authors she cites, which may explain my continuing attraction to Levi-Strauss’s analysis, namely, that animals “are good to think [with].” Much of the attraction of thinking with and about animals has, I think, to do with the issue of boundaries: boundaries between the human and the animal; as well as other boundaries that animals may be seen to symbolize, such as between the living and the dead or between the realm of man and the realm of nature (wilderness; animals). The mudfish is of course a graphic symbol of the ability to transcend or pass through boundaries. Might it not make sense to revisit this particular aspect of animal metaphor, in the light of recent historical analysis that emphasizes a fundamental characteristic of many pre-colonial West African societies? . . I refer to the extraordinarily permeable nature of the boundaries of social categories, whereby human beings may simultaneously belong to categories that, on the surface, appear to be mutually contradictory (e.g. slave and free; Muslim and Christian) To give an example from my own work, one could focus on the multiple and flexible nature of identities in the Luso-African world of the Upper Guinea Coast. My PhD was conferred by the Graduate Faculties of Columbia University, not Teachers College-CU. I began my graduate work at TC and earned an MA in the history of African education. I completed a Certificate of African Studies (MA equivalent), and an interdisciplinary PhD with courses in art history, history, and anthropology at Columbia University . In the end, I took about twice the number of courses required for a so-called “standard” disciplinary PhD – which prepared me well for my work on the arts of Africa/Diaspora — training I have come to value greatly. Thank you. Annetta: Thanks for your comments, and for your thoughtful points on some of the “traps” that animals invoke in our very thinking. Often to separate out signifier and signified (to return to Structuralism) is a bit like cutting a raw egg in two. There is so much yolk and white that runs between the two that it is pointless to try to preserve the separation. Yet at the same time, I would argue that some of the best research and writing on animals in African art and thought has come from scholars grappling with some of the core Structuralist issues of the era (Mary Douglas, T.O. Beidelman, Paula Ben-Amos and others). Peter: Interesting points. What you are suggesting in part is that we frame our taxonomies in ways that often cross different fields. Turner and Van Gennep would readily (and rightly) claim the mudfish as a liminal figure. The issue of taxonomic boundaries also brings back into play (as you evoke) the old chestnut of neat “tribal” categories, language groups, and sexual identities, etc. One of the reasons this issue may be so powerful (important, enduring) is that questions of taxonomy are constantly in a state of being both applied and challenged at the same time. Some cultures — Luso-African — figure in this especially strikingly because they are brought into comparison with a complex set of other dominant cultural frames (French, English, inland African, etc). Suzanne Blier’s “Animalia” essay is as evocative as its subject – the animals in Yoruba art. It makes me recall this popular saying in the everyday Yoruba discourse: “Iseniyan seranko, iseranko seniyan”. I‘ve heard it many times in mundane conversations. Often, it is rendered as a way of likening human behavior to animal behavior, and vice versa. It is also about comparability between what is human and what is animal. And at other levels, it places human within the animalia and also locates the animalia within the human. The Western reality and its theories of the animalia constitute just one of many other realities. They only become traps when all other realities are explained from the prism of one reality. Here, Professor Blier is asking us to (re)discover the Yoruba reality of animalia as rendered in art and ritual/religious practices. Her project, I believe, has far reaching ramifications for making sense of the human condition as shown in the Yoruba interactions, practices, and dialogues about the animal world. “Iseniyan seranko, iseranko seniyan” is pregnant with multiple meanings but I would propose that this statement seeks to explain the sameness in human and animal worlds. It appears to me that it is in the animal world, in animal behavior, that the Yoruba often try to make sense or to explicate their own human condition. Not because they see the human material world as the same as the animal material world. Rather, they recognize the transformative powers of the different species of animals, their qualities, and indeed their adaptive superiorities and predictabilities that often result from the over-specialization of these animals to specific environments. The human world lacks these specializations, yet our material world is roughly an amalgam of these animalia qualities. Hence, the mudfish, for its ability to hibernate in periods of droughts/dry conditions, and to become “alive” and active in times of wetness, is an equivalence of death and resurrection with powerful healing powers in the material existence of humans. Likewise, the lizard is often depicted in arts and other domains to evoke and harness its powers of spontaneity, awareness, and agility. Snakes are also revered for their regenerative qualities. Crocodiles are revered as antidote to hardship; and the slow, deliberate, qualities of chameleons easily translate to the powers of reflections, patience, and calmness – the very foundation for iwa pele – good character which the Yoruba consider to be the equivalence of ultimate beauty. There are many other examples. In 1997, I excavated a 13th-16th century burial site that revealed the remains of a decapitated individual. Buried with the individual is the skull of a sheep/goat/ram and a snail, among other animals. Since I‘ve also noticed the prolific presence of ram in Yoruba arts, I was curious to know the “meanings” of ram in Yoruba religion and beliefs. I talked to Professor Wande Abimbola (Ifa priest, professor of Literature, and Agba Omo Oodua) who offered that, in Yoruba cosmology, the ram is the gatekeeper between the heaven and earth. Now, to fully understand what this means, one needs to know the social construction of the “gatekeeper” in the inseparable Yoruba world of materiality and spirituality. What is fascinating in the contemporary Yoruba world, as well illustrated by Suzanne, is the recurrence of the same animalia themes in the ancient art, present-day rituals, and contemporary oral texts. Ontologically, a sharp boundary between the Yoruba world and the animal world is unthinkable. Powerful and knowledgeable people (awo) are said to turn into animals and have the ability to transform other people into animals, and vice versa. Likewise, some animals are believed to have the spiritual powers to become human. The African Paradise Flycatcher bird (okin) that Blier mentions in her essay, “notable for their bi-morphism and for rarity and distinctiveness” are frequent imageries that adorn Yoruba great crowns – the ultimate symbol of royal power. Iconographically, the dense attributes of okin that juxtaposes the bird’s biology/ecology as well as the ascribed Yoruba cultural qualities of the bird, offer multi-layered explanations of the power, prestige, and meaning of Yoruba kingship. Thus, the understanding of the distinctive qualities of Yoruba kingship is not complete without understanding okin. Likewise, we are unable to figure out what okin is without reference to the Yoruba kingship institution. Hence, the saying: okin loba eye (the okin bird is the king of the avian kingdom). And, in Ifa Divination text – the Yoruba wisdom text, some past kings are referred to as okin. The birds on the Yoruba beaded crowns however mean more than the okin bird. Those beaded avian representations also represent the power of the “Mothers” – wise women. Ultimately, the Yoruba king rules with the approval and protection of these women who have the power to act singly and collectively for good and for bad. I am not convinced though that these Yoruba iconographic practices have foreign roots in the Greek, Coptic, and Early Medieval European idioms as implied in Blier’s essay. It seems to me that the intellectual project of seeking the origins of the “meaningful icons” of the Yoruba (and of other Africa south of the Sahara) in the esoteric world of the Greeks, Romans, Egypt, etc. has not moved beyond mere declarations in the past 100 years. Leo Frobenius and other scholars after him have only made assertions of foreign origins of Yoruba icons, they have not proved it. Professor Blier asks: “Since the ram,…the mudfish and bi-morphic birds, is so closely integrated into the fabric of Yoruba belief, does it really matter where these motifs originally came from, when they arrived, or how?” My answer is: YES it does matter. These are important questions but the Yoruba discourse of animalia can only contribute meaningfully to the humanistic inquiry of human conditions, as a process within the overall evolving animal kingdom, when we jettison the oft-repeated a priori assertion that the animalia motifs in the Yoruba world originated from the outside world, especially the Mediterranean Basin. For, as long as we continue to seek foreign origins for the motifs, thoughts, and reflections that have come to define what we know today as the Yoruba world, we will be unprepared and unable to see what is glaringly there: that these animals have been local participants in the creation of the Yoruba world. As co-inhabitants of the Yoruba environment – physical, social, and cultural – these animals have played critical roles in the long journey of the creation of the Yoruba, beginning ca. 500 B.C – 500 A.D. In fact, some contemporary Yoruba thinkers might say these animals are Yoruba. The central role of the animalia in the discovery of the Yoruba selves, and their understanding of the world as is and as it should be; their intellectual project of building cultural institutions, of transforming wilderness into cities, of developing political hierarchies and authorities, of creativity and aesthetics, and of everyday living are important (and potentially rewarding) loci of inquiry for the contemporary scholar. The Yoruba leave us with massive artistic data as well as textual references regarding the animalia. Professor Blier’s essay should elicit vigorous efforts to make sense of the Yoruba discourse in arts and texts about the sameness of the animal and the human. Perhaps, if we start from unlocking the meanings of “Iseniyan seranko, iseranko seniyan” we will be able to begin making sense of this Yoruba discourse as a critical contribution to the theory of animalia. Thanks to Suzanne for drawing our attention to this subject. Henry, thanks. To make sure I got it right, I checked with the Records and Transcripts office of the Columbia University School of Education (which also lists itself as Teachers College on their website) and they affirmed that you received your Ph.D. from there in 1972 (the field: “Philosophy and Social Science, Education, and African Studies”). Your Ph.D. thesis “Efe/Gelede: The Educative Role of the Arts in Traditional Yoruba Culture” from the above program (which I recently reread) is an interesting one in no small part because of its focus on art, education, and pedagogy in relationship to Africa. Education, of course, IS very much a “standard” and important academic field. The issue is that there often are different vantages at play. At Columbia, Education is a separate School/Program from the Columbia Faculty of Arts and Sciences where both the Departments of Art and Archaeology and Anthropology are located (although students from other schools such as the Teachers College also can take courses for certificate degrees etc.). I highlight your Education degree as well because I believe this perspective also constitutes a real asset, particularly in terms of broader comparative and pedagogical issues at play in understanding both society and art. My main point, however, in terms of this footnote, is that at Columbia, as elsewhere, departments (and schools) have different sets of disciplinary requirements, languages, etc. for those earning Ph.D.s specific to these fields. As with the central thesis of my essay, African art scholars – like others – come to our fields from many backgrounds and points of view. Inherent therein are different disciplinary frames that emphasize varying types of “core” knowledge (some relatively “standard” in each field) as well as distinctive ways of questioning related data. Of course, each of us also defines/expands/engages with our fields in unique ways as well! Akin, thank you for underscoring in such detail the richness of the Yoruba verbal and visual nexus as it relates to animals! The link between the mud fish and shared ideas of death and resurrection is apt in terms not only of seasonal transition (offerings and new year’s rites), but also later Western-linked beliefs that may also have resonance with Christianity (Mami wata among these). The ram – as gatekeeper and transitional figure between heaven and earth – is also noteworthy, hence, its importance as an offering. Your discussion of the okin bird is striking too, suggesting how the Yoruba have drawn on its rich physical AND metaphysical attributes. 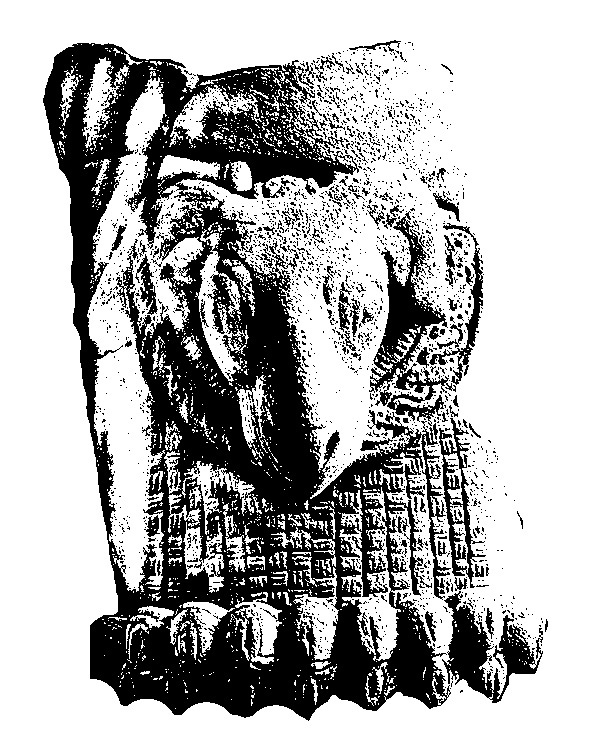 The latter also come into play in other animal portrayals, among these rams which in ancient Ife are shown in art works not only as what appear to be “generic” messengers, but also icons linked more specifically to select deities (especially Sango/Shango and earlier, Oramfe “thunder”) as Babatunde Lawal has discussed. This deity pantheon also is closely linked to the Oyo Yoruba dynasty and the second dynasty Ife military hero Oranmiyan. In more general terms, the difficulty with animals in early Ife art (and elsewhere) is how to determine when an animal is being identified in one context versus another. 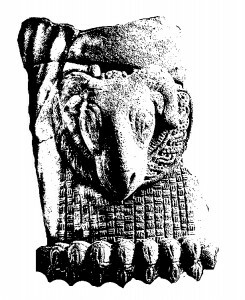 In the early Ife art corpus, rams are shown both as offerings (terracotta or stone heads alone or positioned on platters) and as what appear to be dynastic avatars, the latter attired regally in a manner evoking kings (Lafogido and Oke Eso examples especially). The same sort of image complexity as related to animals occurs in other global contexts too. I am happy you picked up on what I had hoped would be one of the more controversial elements of my essay – the Issue of origins, meanings, and symbolic hierarchy. My larger aim was to emphasize multiplexity, with local and newer forms becoming part of the whole cultural matrix – much as Mami Wata is imbedded with earlier mud fish symbolism. But to respond specifically to you on the point of sources: Considerable evidence suggests that the thirteenth to fourteenth century African, European, and Asian worlds were marked by notable Internationalism and travel (witness Marco Polo, Ibn Battuta, Mansa Musa, as well as Ethiopian group who travelered to the Avignon to offer support to the Pope in fighting Islam). Indeed I believe that Battuta is describing Ife in his early fourteenth century reference to a kingdom to the west of Mali, notable in part for its extraordinary wealth. Ife in this era seems to have had an international “pulse.” The famous blue-green Ife glass beads were found as far away as Mauritania, Mali, and Ghana. At Ife itself there is evidence of cowries from the Indian Ocean and crotals (an ancient bell form) which have early prototypes in southeast Asia, India, north East Africa (Egypt) and Europe as prestigious decorative items for humans and horses. For other examples of international trade in this broader region one can point to a Nubian work discovered Niger to the north of Ife and Coptic language forms that today are common in the Hausa area. 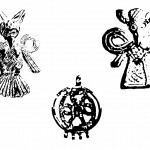 In Ife itself, a stone pendant unearthed by Ekpo Eyo at the royal burial site of Lafogido (along with the famous “royal” animals) bears a Maltese (Coptic) cross, similar to one that also appears on the robe of the standing copper alloy figure from the Niger River crossing site of Tada. Interestingly, in the early sixteenth century, Leo Africanus describes meeting a merchant from Damietta (the Nile-Mediterranean Coptic textile manufacturing center) in a kingdom in West Africa that was notable for its wealth. Scholars debate the identity of this West African kingdom, but I believe it most likely was located in the Niger-Benue river confluence area near Tada and Jebba. Among the gifts this trader presented to the local ruler was a royal robe. The Tada standing figure wears a robe that seems clearly to reference a Coptic model, complete with textile sashes, and what appear to have been embroidered motifs (loop winged birds among these) . The interlace circular medallion found on this figure (and the related figure from Jebba island) are also characteristic Coptic textile forms. The remarkable fourteenth to fifteenth century Tada copper alloy standing figure wearing this robe was housed in the same shrine as the famous Ife seated figure in copper – as well as another Yoruba-linked copper figure displaying the characteristic gesture (left fist above right) of Ogboni, the Ife and broader Yoruba association dedicated to (among other things) the promotion of regional commerce. Ife’s early identity with this key Niger River crossing point clearly was central to its thriving economy. Similar robes and textile elements from Damietta and other Coptic sites show an array of animalia exotica: sirens (notable in part for their outward fish form legs), harpies (with unusual loop-form snake-like wings) and gorgon heads (featuring serpents exiting facial orifices and/or hair), motifs that also have a rich and complex history in the Mediterranean, African and European worlds. Much like the mudfish, clearly these animalia motifs had important local symbolism and when/if new motifs were circulated here as textile motifs or other forms, they would have only resonated locally if they made sense in terms of existing forms (visual and social) already in place, with new and older forms becoming part of the larger visual matrix. Let me end with another example familiar to many, the lion. This feline, a prominent royal symbol in Great Britain (and other European monarchies), has its political and iconographic roots far away (in time and place): the Ancient Near East; the lion’s native African habitat also is far removed from European royal centers. The very foreignness of the lion (its ties to a temporally remote and powerful empire)made this animal an especially potent symbol. Significantly in West African art (in Ghana and Dahomey for example), the lion comes into prominence especially in the Victorian era via gifts and other prestige items originating in England and other European capitals. I’d like to come into this conversation by commenting on how human and animal imagery are combined to create an image that may be read as ‘monstrous’ or ‘grotesque’ or ‘powerful’ or ‘numinous’ or some combination of these – and how distinctive some Yoruba and Edo imagery is in this regard relative to the way this is accomplished in many other sub-Saharan African cultures. The use of snakes, crocodiles, or mudfish emerging from the nostrils of a human face makes a shocking image, all the more so because the human aspect is maintained. In many masquerades that combine human and animal features, the anthropomorphizing element is the often recognizable human figure of the mask carrier; the animal feature is the mask or headdress—however it takes shape, as a stylized animal, composite animal or face with such animal attributes as horns. Despite the transformation of the human porter into a personified spirit, the anthropomorphism tempers our response as does the internal logic of a character developed by costume, movement, and music/text. It’s the disruption of the humanity by the addition of the snakes/crocodiles/mudfish that is so disturbing. Similarly, and I refer to my own field research here among the Okpella , an Edo speaking people living north of Benin City in southern Nigeria, the Elders’ masquerade binds together things that don’t belong together, like snakes and noses, thus exploiting a visual and intellectual dissonance for expressive purposes. Never Fully Understand It, So You Must Keep Looking At It.” The name communicates the visual tension created by the combining things that don’t go together, at least not in the same figure, and that is what renders this image so compelling to the Okpella audience. Nor were the elders of Okpella hesitant about recounting the history of this form. They did not see their commissioning work from outside the community as anything but a strategy to bring something new and original into play. Suzanne Blier wrote a short essay on this based on the published literature and focusing on Igbo and Ibibio forms: “Beauty and Beast” in Douglas Fraser (ed. ), African Art as Philosophy, NY: Interbook, 1974, 107-113. Research in Nigeria was carried out from 1971 to 1974 under the auspices of the Nigerian Federal Department of Antiquities and partially funded by the following agencies: Museum of Cultural History, UCLA-Ralph Altman Fund; Regents of the University of California-Patent Fund; and NDEA Title VI grants awarded through the African Studies Center, UCLA. ; in 1979 with the support of an ACLS –SSRC grant under the auspices of the University of Ibadan, Institute of African Studies, and in 2002-2003 by a Fulbright-Hays Teaching and Research Fellowship and the University of Benin, Benin City. See Jean Borgatti, “Okpella Masking Traditions,” African Arts IX, 4, 1976 and From the Hands of Lawrence Ajanaku, Museum of Cultural History Pamphlet Series Vol. 1, No. 6. UCLA. 1979. My second but continuing comment concerns the issues of cultural borrowing, originality, authenticity – a natural segue from the case of Okpella’s Elders’ masquerade. These issues have been variously defined by different interest groups at different points in time during the past 100 years and have marked the attitudes surrounding the study of African art. A reading of the work by art historians concerned with these issues (To just note two: Sidney Kasfir’s Contemporary African Art, London: Thames & Hudson 1999 and Olu Oguibe and Okwi Enwezor’s edited volume Reading the Contemporary, Cambridge MA: MIT Press 1999) brings to mind the idea of center and periphery, an economic model that has been applied to art in the context of modernism: artists from the center (Europe) were able to appropriate forms as their ‘raw material’ from the periphery, i.e. the rest of the world, and transform them–fundamentally changing the direction of European art—without impugning their sense of originality. The direction of movement, however, was one-way. Any non-Western artist whose creations were believed to be the result of appropriations from Western sources was deemed a mimic with a colonized mind. This is not only a central issue in the discourse that has developed around the history of particular modernism(s) and post-modernism(s) in African art but one that continues to plague a dispassionate consideration of cultural exchange between sub-Saharan African cultures and cultures linked to the Mediterranean basin and beyond, and located in a more remote past. Thus Akin Ogundiran decries the suggestion that Yoruba [recognizing that this is a 19th century colonial construct in itself] artists from Ife and Owo in particular incorporated into their work visual information that not only may have come from elsewhere but also may be seen to be important over a long period of time. I would agree with Suzanne Blier that it’s a mark of the cosmopolitan nature of a culture to incorporate new ideas into their visual culture for their own expressive purposes. At the same time, I would agree with Akin Ogundiran on the importance of understanding the Yoruba discourse – in this case linked to ‘animalia,’ – not that this was ever questioned. I use the example of Okpella’s Elders’ masquerade to underscore both the ideas of disrupting humanity with animal imagery for dramatic expression and the human capacity for incorporating strong, but foreign, imagery into a culture’s visual vocabulary without threatening its originality. That problematic idea is ours. Is diffusionism still a useful theoretical approach? As Suzanne Blier writes, a discussion of origins and influences is indeed the most provocative section of her essay. Dr. Ogundiran reminds us that diffusionist studies (such as Douglas Fraser’s work on “fish-legged figures”) now seem to many of us to be expressions of the colonialist assumption that West Africans were incapable of innovation. Yet in the light of more recent theorizing (Gell’s “agency”, Appadurai’s “social life of things”, Thomas’ “entanglement”, and the upcoming College Art Association panel on “Thing Theory”), perhaps this 20th century paradigm can be re-visited. As Jean Borgatti points out, appropriation is increasingly seen as an interactive form of creativity. There may indeed be fascinating questions early studies can raise concerning the transmission of African motifs across time and space – especially as new archaeological evidence comes to light. Perhaps Amun, the Nubian gatekeeper, is indeed a descendant of the ancestral deity who also became Shango! But as Dr. Ogundiran points out, archaeologists and historians prefer to work with actual facts rather than with simple declarations of belief. How does Prof. Blier propose that Nubian gold ornaments, placed in royal tombs in Meroe prior to the 3rd century AD, left an “imprint” upon regalia in Ife a thousand years later? She reminds us Ife was connected to trade routes that criss-crossed the African continent, but was the Nile valley linked to the Lower Niger when Meroe was a flourishing kingdom? What goods (metals, textiles, books, art works) were actually carried along those routes in the 12th century AD? Would it have been possible for an Egyptian merchant based in Damietta during the Mameluk Period (the early 16th century) to bring robes to West Africa that had been embroidered by Copts during the Greco-Roman period (during the 2nd century)? If not, were there any textiles produced in Mameluk Egypt that display Islamic versions of Gorgons or mermaids? Diffusionism (and any other theories at our disposal) should be limited, I believe, to relationships we can trace through specific objects. Hi Jean, Thanks for your long and insightful comments from the Okpella vantage. You have put your finger on some of the complexities of these forms in terms of symbolic weight and iconic power as well as image cross-currency (cosmopolitanism). Exploring local meaning (especially different vantages of local meaning) is key. And, what do we mean by local? I am less comfortable with the sort of broad ethnic framing (i.e. Yoruba) that historically has been used to discuss animal symbolism, in part because the religious and historic vantage at Ife is in many ways quite different than that of other regions in the Yoruba sphere — with variant deities, and dynastic forms etc. that are little known elsewhere. I also think we may underestimate the importance of status or class in how meanings come into play. Several early Ife animal portrayals for example appear to carry political symbolism that rarely is addressed in commonly cited oriki or other verbal forms. (Is there a class factor at play as well?) Stated simply, animals (like other symbolic motifs) mean different things in different historical and socio-political contexts — even among the Yoruba. Hi Monica, I am glad you joined us. First, I should emphasize that Diffusionism as a theoretical frame (extending back to German Diffusionists such as Heine-Geldern) is defined very differently than what I am discussing here. Diffusionists speak about the retention (often “hidden”) over long periods of time of ideas or forms that arrived generally from long distances and at much earlier times. I have no interest in reviving Diffusionism. I am speaking here of goods that were traded or carried and influenced works, most likely, around the time they arrived. African Historians, and others, have begun to move beyond more narrow ethnic or regional vantages to think about exchanges across the continent in earlier eras. The facts on the ground (and yes I also am interested in “facts”) provide ample evidence of the movement of goods and populations across Africa in earlier eras, these cross-currencies shaping culture and politics in critical ways. To answer your questions specifically: Damietta robes and other textiles mentioned by Leo Africanus were NOT second century C.E. 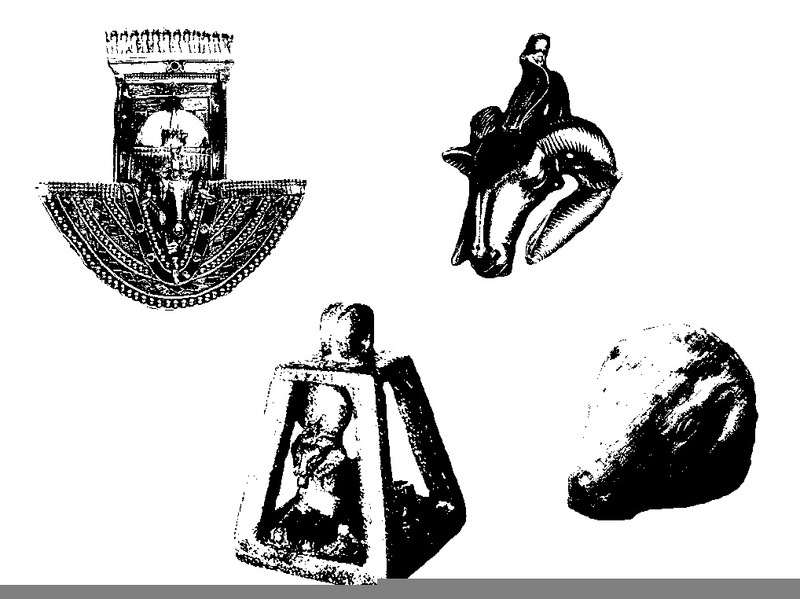 examples, most likely, but contemporary Coptic exemplars from Leo’s era. The Copts continued to be a dominant force in Damietta and in certain other parts of Egypt much longer than once was thought. Damietta indeed is still a Coptic center! The Tada figure’s robe looks very similar to Coptic robes I have seen that are dated to the fourteenth-fifteenth century C.E. – and indeed also in some way resemble robes worn by Coptic patriarchs today. Coptic weavers were producing textiles for both Muslim and Christian patrons, but most of the examples of textile medallions and other forms I have seen with Gorgon and related imagery have been identified by specialists as Coptic (i.e. Christian). It is my belief that while Nubian and Coptic goods reached parts of West Africa at various earlier times, the work(s) that seem to have been a source for the Ife ram fragment probably arrived around the period that the work was made, i.e. late thirteenth to early fourteenth century. Remember that Ife was a very wealthy center, based in part on its bead exports (and possibly gold) and Egyptian and Nubian goods were being sold as relics during this same era to Europe. For books (manuscripts): several Yoruba and other scholars have identified a group of Arabic texts as a partial source for Ifa divination. The authors of these manuscripts are praised by Yoruba diviners and healers today as part of rituals; one of best known of these Muslim authors lived and wrote in the fourteenth century, and his writings are said to show evidence of ties to both Persia and China. Of course, in the end, in the broader sphere of things, these foreign forms matter little to what we know to be the larger Yoruba “cultural matrix.” Similarly, Mami Wata is simply one of many religious personae who are worshipped. Much like animals, outside forms are domesticated (civilized) into the belief system and visual culture itself. Yet the care, in Ifa divination for example, with which the name of the original source was retained half a millennium later, suggests how important it was to acknowledge this source. In the end, nowhere else in the world do we find the special brilliance of art and thought that came to distinguish ancient Ife. Ife was (and is) truly unique, but part of that uniqueness, I believe, was its broad commercial and cultural reach, as well as its interest in the world outside. Animalia, History, and Theory: short post script to several of my above comments. A few days ago I emailed the ram images I included here (the photos) to an Egyptian art scholar who is organizing a conference later this spring that I was invited to participate in for thoughts (and critique). As the only “Africanist” participating, I didn’t want to arrive and immediately jump off the deep end. Because of the iconographic specificity she was supportive of the point, but more importantly, was interested in the ramifications of the possible connection because as she put it (paraphrased) “It makes the case that ancient Egypt is African.” (I proposed also to address complementary rituals linked to water control and flooding of both Elephantine [a key Nubia site on the Nile] and the Niger-Benue River Confluence area around Tada.) Still today most scholars see Dynastic Egypt to be of Middle Eastern not “African” origins. So the issue may be interesting in both ways. I am deep into a book on Picasso and Africa, and one of the things that scholars of that material were saying about a decade ago is that different theoretical vantages work for some topics and not others, i.e. semiotics is key to understanding Picasso and Braque but not Cezanne. In a way that also makes my point (and really complicates the way we have often come to theory) — but in a way, like animals, some theories are better to think with in terms of certain problems.